This is the commission I got from one of the friends I play D&D with. 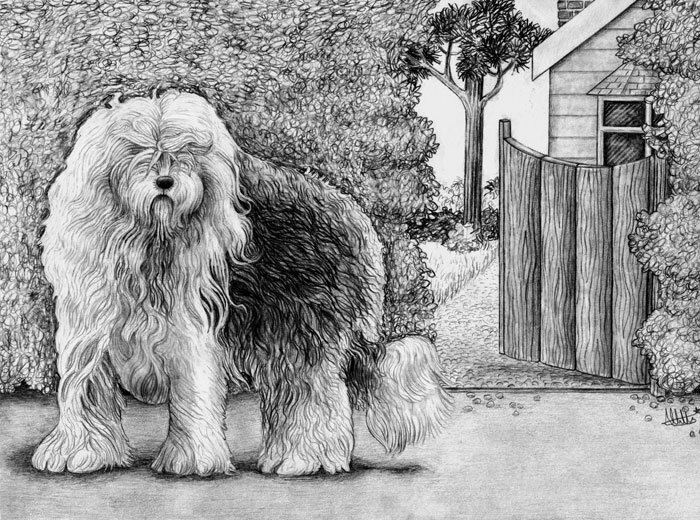 I was for his girlfriend as a Valentines Day present because they both adore Old English Sheepdogs and want to have one as a pet one day. Aww! Apparently she loved it, and now I can post the picture of it here in my blog without any risk of ruining the surprise. 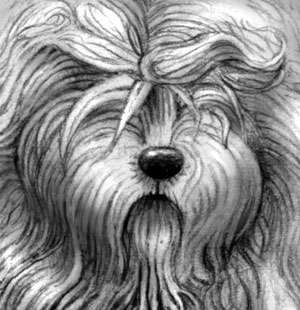 I used photo reference and drew with a very light pencil at first; I wanted to detail as much of the hair as possible, I mean, an Old English Sheepdog is pretty much ALL hair so it’s very important (such a big, hairy and beautiful breed)! Then I gradually added the darker tones and shading, using a smudge stick to gently blend. It was rather fun, and I got to use a lot of different line types to create the textures in the background. YAY!